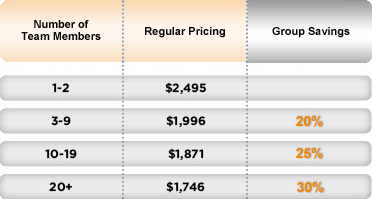 See the chart below for an example of how much savings groups of 3+ can enjoy on one of our most popular conference packages: Conference + 2 Tutorial Days. To take advantage of this offer, please call the Client Support Group at 888.268.8770 or 904.278.0524 or email [email protected] and reference promo code GRP3. Better Software alumni are eligible to receive up to $200 off their registration fee (depending on conference package selected). 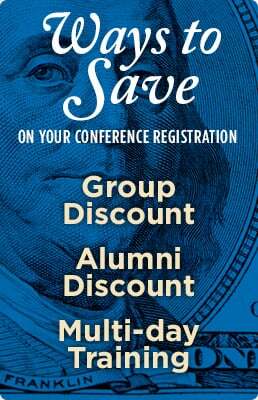 Additionally, if you are an alumni and are unable to attend the conference this year, you may pass your alumni discount onto a colleague. Please call the Client Support Group at 888.268.8770 or 904.278.0524 or email them at [email protected] for more details on this special discount offer. Attend any of the training courses + the conference and save $300 (already included in conference pricing). Please Note—We will always provide the highest possible discount and allow you to use the two largest discounts that apply to your registration.